It could take years for Iowa Democrats to recover from the utter shellacking they took on Tuesday night, when a total realignment in voting trends struck the state hard. Some rural and blue collar counties that went for Barack Obama in 2012 saw swings to Donald Trump by as much as 30 points. Democrats lost every single one of the highly competitive senate and house races and even a few that weren’t on the playing field. Trump won Iowa by 10 points, a 16-point swing from Obama’s 2012 result. Many counties saw massive shifts from that year’s numbers. Rural and working class counties took a hard right turn, with Democrats seeing their traditional strength in Mississippi River counties like Dubuque, Jackson and Clinton completely evaporate. The only places where Democratic margins fell the least were the urban centers, but even there things went poorly for the party. Dallas County was one of the only bright spots in that Trump’s support fell there four points from Romney’s numbers – it was still plenty red. Chuck Grassley defeated Patty Judge by a 60.1% to 35.8% result. No surprise there. Dave Loebsack remains Democrats’ only federal official with a closer-than-expected six-point win. Monica Vernon lost 46.1% to 53.9% in the 1st, Jim Mowrer lost the 3rd 39.8% to 53.5%, and Kim Weaver lost in the 4th by 38.6% to 61.4%. Democrats fell to one of their worst margins in years after losing a devastating six seats, and possibly a seventh. At the moment, the Iowa Senate is 29 Republicans, 18 Democrats and one independent. One Democratic-held seat is too close to call, and the special election to fill Joe Seng’s seat in December can no longer be considered a safe hold for the party. Here’s the results, with asterisks for the Democratic-held seats. As many expected, Democrats lost both Brase and Schoenjahn’s districts. Democrats feared Wilhelm, Sodders and even Gronstal were at risk, and they lost too. The biggest surprise of the night was Tom Courtney’s defeat in his Southeast Iowa district that covers Burlington and the rural areas above it. I wrote earlier this year that Democrats should keep an eye on that Burlington-based seat, home to many blue collar voters, but I didn’t think the GOP would pick it up after spending barely anything there. There is still one precinct out in Taylor’s race, where he very narrowly leads. Graber seems like a conspiracy theory nut, so that would be an interesting addition to the Republican caucus if he pulls out a victory. What is particularly shocking is the size of the losses in several districts. Wilhelm won her 2012 race by 126 votes against a tough opponent. She lost last night by 24.7 points. Schoenjahn lost by 20 points. The shift in party allegiances in rural Iowa was absolutely massive. Interestingly then, both Mathis and Danielson’s races were rather lopsided in the other direction. Danielson has survived extremely close races in the past; last night he won by 17.5 points. And Andrew Barnes, the Democrats’ candidate who got no help in a suburban Polk County district on few people’s radars, actually didn’t do half bad, losing by 11.6 points. This will be a seat Democrats look at in the future. With losses this big, it will be practically impossible for Democrats to retake the Iowa Senate in 2018, given the number of opportunities on the map that year. This is a multi-cycle rebuilding effort. While the huge Trump wave obviously made the biggest impact, Senate Republicans ran an impressive operation this year, while the constantly under-performing Senate Democrats political effort was finally exposed for the joke that it is. More on that later. Democrats failed to pick up a single seat on Tuesday night, and ended up losing two of their own districts in Northeast Iowa. The Iowa House should stand at 59 Republicans and 41 Democrats. The extent of the night’s losses became apparent very early on when quick returns from the Polk County Auditor showed all three of the most competitive races – Konfrst, Celsi and Matson – losing. If Democrats weren’t able to pick up the suburban seats where their overall numbers looked better this year, they weren’t going to get much of anything. Donahue’s loss in Marion will be particularly tough to accept. Democrats’ biggest losses came up and down the Mississippi River, losing two currently-held seats with Ruff and with Dunkel’s open seat in rural Dubuque. Krumweide, Wiese and Drew seemed to have no chance with the wave. Even Thede came close to losing in her Scott County seat. Younger candidates like Ritter and Kean were handily defeated by older Republican men with deep ties in their communities. Rural seats where Democrats hoped to pick up a district or two, like with Whitehead and Hejhal, were instead wipe-outs. House Democrats can count themselves lucky that they still have 41 seats. With a wave like this, one could easily see a situation where Ourth and McConkey suffered surprise defeats, but they both held on. Indeed, considering Senate Democrats lost a third of their total members, the House team should get some credit for minimizing their own losses. As long as the IDP protects the old guard and plays nice with hard-edge Republicans, it will continue to weaken and fail. Branstad has no respect for or fear of the IDP. Until the IDP decides to FIGHT for its life (our lives), it will continue dying. The German people thought they could contain Hitler and stayed to regret their mistake. I, for one, will leave Iowa and the USA as Der Fuhrer of the Fourth Reich cripples the economy (the stock market is already sliding down), seek vengeance against his self-perceived enemies and erase the EPA, Education and other entities that challenge big business and wealth. This is what happens when the presidential nominee is the most disliked in party history. The way forward has to be a hard turn back to the left. I will never understand how so many people can vote against the best interests of their own family based on FACTS vs non-reality and ideology. Are you so fearful of the world/change? Stop telling them what their own best interests are and listen to them instead. You know, in Clinton County our Dem County Sheriff was unopposed, and our Dem County Auditor won handily against a well financed R opponent, and I won by a lot against an R opponent. I don’t know what that signifies, other than that Clinton County hasn’t embraced the Trumpian/GOP philosophy. A “pathway to success?” Most anxious to hear your take. 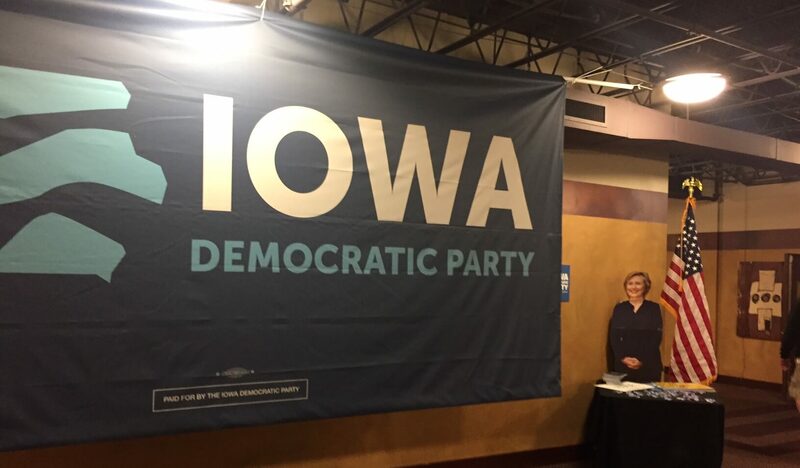 It sure as hell won’t occur as long as Iowa, First in the Nation, continues to shell out free passes to the “old guard.” Bernie never had a shot, as long as there were those “Super” delegates automated to the national convention. They had committed their votes years in advance.